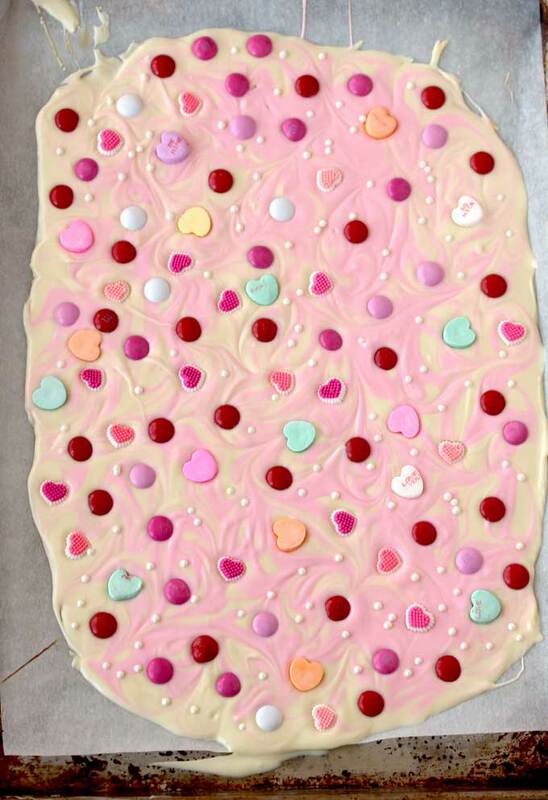 This Valentine’s Bark is sweet, delicious and incredibly addicting. 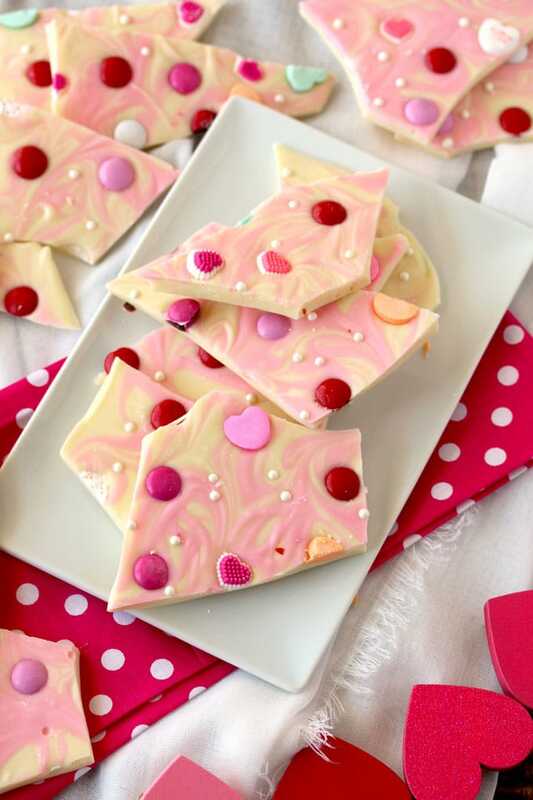 This no bake, stress-free and fun dessert is made with white chocolate, marbled with pink vanilla candy melts and decorated with assorted Valentine’s theme candies. This is definitely the easiest homemade gift you can make! I think I have mentioned before, when it comes to holiday treats, I am a last minute type person. This was not always the case. After having my first child, I went through a “Martha Stewart wanna be” phase. 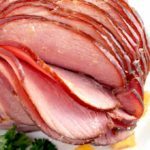 I baked, cooked, entertained and made homemade gifts for every single occasion and holiday. Everything was carefully planned, every detail had to be perfect. By the second child I was too tired to care! I know that sounds bad but honestly, life is too short to stress about perfection. 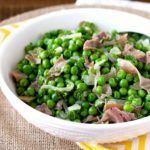 Now I take shortcuts and settle for easy as long as it is delicious! Pretty is also important. We eat with our eyes first! I must also confess that for years you could not pay me enough to eat white chocolate. I was a chocolate snob! 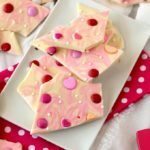 I was even a bit hesitant to post this recipe because of my past snobbishness – but I must admit, this Valentine’s bark is addicting! Once you have a little piece, it is hard to stop eating it! The chocolate should be cut into smaller pieces. 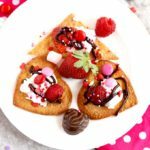 For this recipe I use chocolate chips and small candy melts so the size is perfect already! Place the chocolate into a microwave-safe glass bowl. Heat the chocolate in 30 second intervals, stirring after each interval. At the beginning it will feel like the chocolate is not really melting and you may have a hard time stirring. No worries! It will get soft, I promise. Continue until the chocolate is completely melted and smooth. 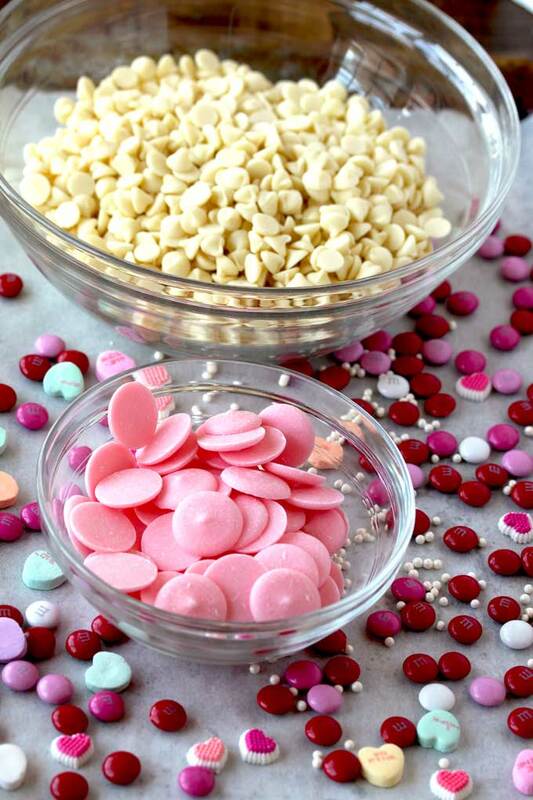 Melt the white chocolate and candy melts. 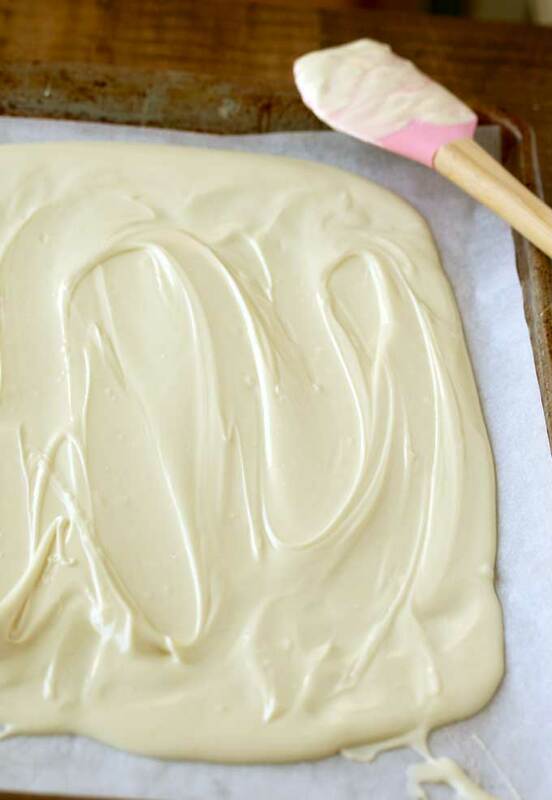 Pour the white chocolate onto the prepared sheet and with the help of a spatula spread it evenly. It doesn’t need to be perfect. 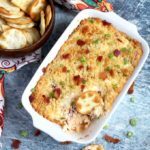 You will add stuff on top! Drizzle the colored candy melts randomly across the surface of the white chocolate then drag it through with a toothpick or skewer to create a marbled look. Sprinkle the candies on top. 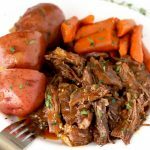 Let it set and get hard at room temperature, in the refrigerator (for an hour) or in the freezer (20 minutes). My chocolate hardened before I added the candies. Now what? When working with chocolate sometimes you need to be quick as the chocolate may set and get dry. This is not always easy to do especially if little ones are helping. If you are wondering how to adhere the candies at this point – no worries! Keep reading! Place the oven rack in the lower middle of the oven. 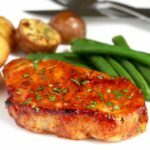 Place the baking sheet with in the oven for no more than 45 seconds to a minute at the time. Just keep checking to make sure the chocolate is melting nicely. It won’t take too long. Just keep an eye on it. 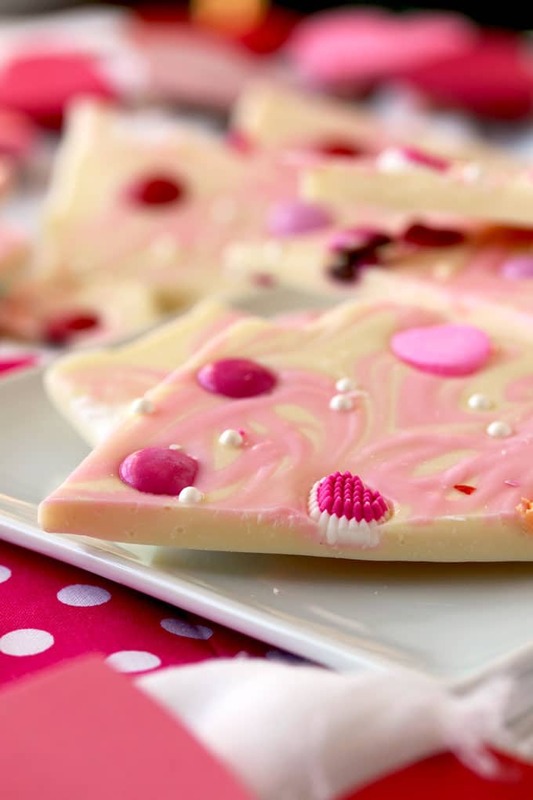 WANT TO TRY THIS WHITE CHOCOLATE VALENTINES BARK? PIN IT TO YOUR DRINKS OR SMOOTHIE BOARD!! 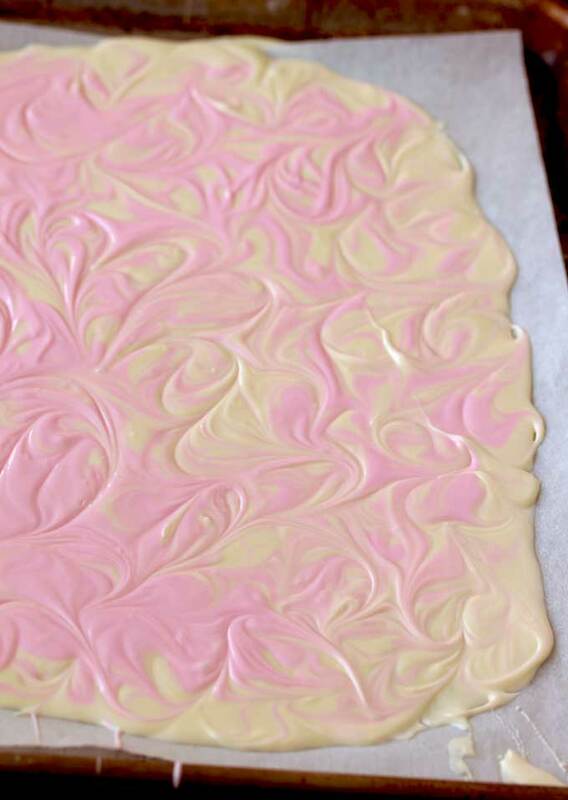 This Valentine's Bark is sweet, delicious and incredibly addicting. 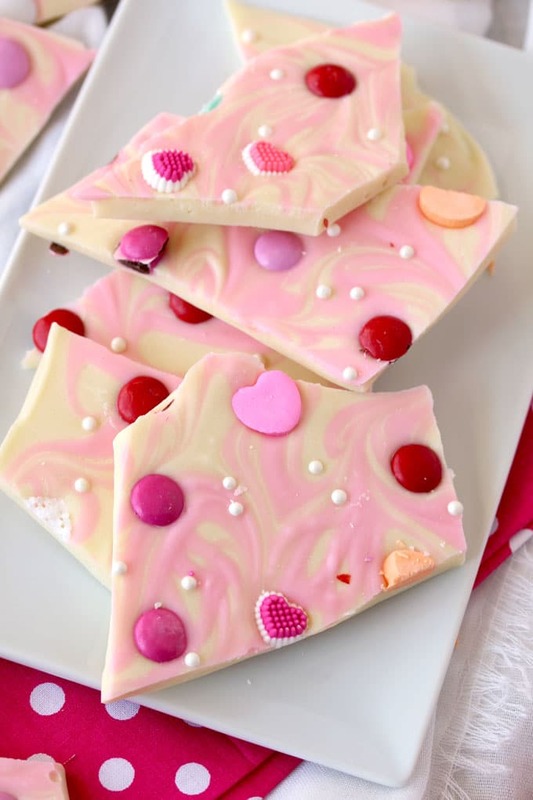 This no bake, stress-free and fun dessert is made with white chocolate, marbled with pink vanilla candy melts and decorated with assorted Valentine's theme candies. 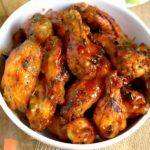 This is definitely the easiest homemade gift you can make! Add both bags of white chocolate chips to a microwave-safe bowl. Melt the white chocolate in the microwave for about 1 minute, in 30-second intervals, stirring at each interval before returning to the microwave, until it’s completely melted and smooth. Melt the colored candy melts using the same process. 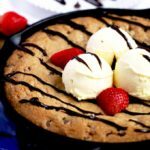 Pour the melted white chocolate onto the prepared baking sheet pan and with the help of a spatula, spread into an even layer. 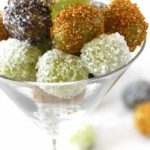 Drizzle colored candy melts randomly across the surface of the white chocolate then drag it through with a toothpick or skewer to create a marbled look. While the chocolate still wet, sprinkle the candies on top. 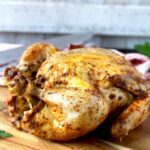 Refrigerate for about 1 hour or until completely set or freeze for 20 minutes. 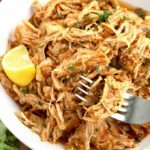 Peel off the parchment paper and break into pieces. Serve. Nutrition facts - calories: Approximate as it depends on the type of candy/sprinkles you use. 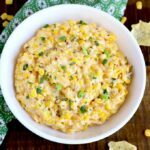 I love how you shared an easy recipe for last minute people like me! And that I can heat the choc in the microwave?!?! Winning!